Centre Bowl Base 14 in. 3100 Arched Base 15 in. Y3715 Round Corinthian 9 x9 in. M080 Mini Pedestal 2H x 5x5 in. P107 Globe Holder- base 3 H x 6.5 in. 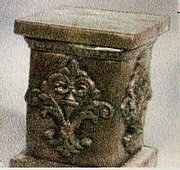 WP23 Mini Pedestal 6 in. Y150 Short Pedestal 6 in.